I've been working on a series of artwork showing a destructive human footprint in nature. 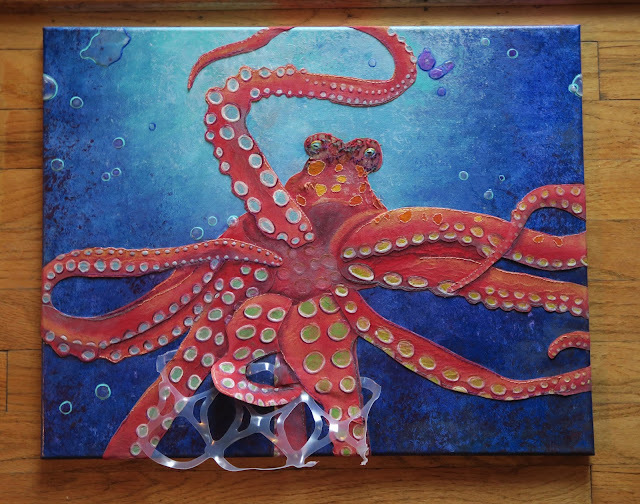 My latest piece is an octopus with plastic from a soda pack attached to it. I first want to start out by saying that it's both good and bad having a dad and husband that are artists. They are there to critique me. They are also there to roll their eyes about what I'm doing. The men in my life loved what I created, but they would have done it differently. My dad's not into color, and I am. The octopus in my reference was blue, and I totally changed it. 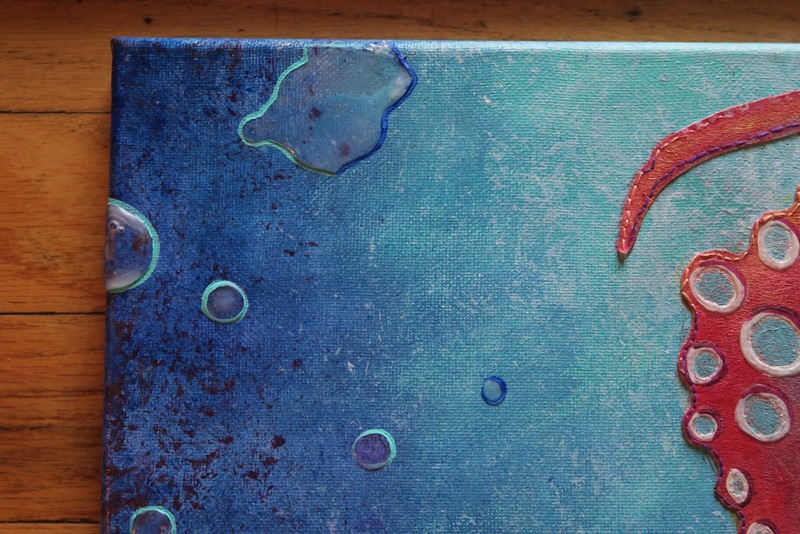 I started out with just a blue background, and used a plastic store bag to add different shades of blue. Then I drew and cut out the octopus in different layers. I had a hang up because the fabric was iron on. Glue and clear medium wouldn't stick to the fabric. I had no choice, but to iron on the fabric to the canvas. It was interesting going around the sides. It was really hard when I got to the plastic, and it started burning. 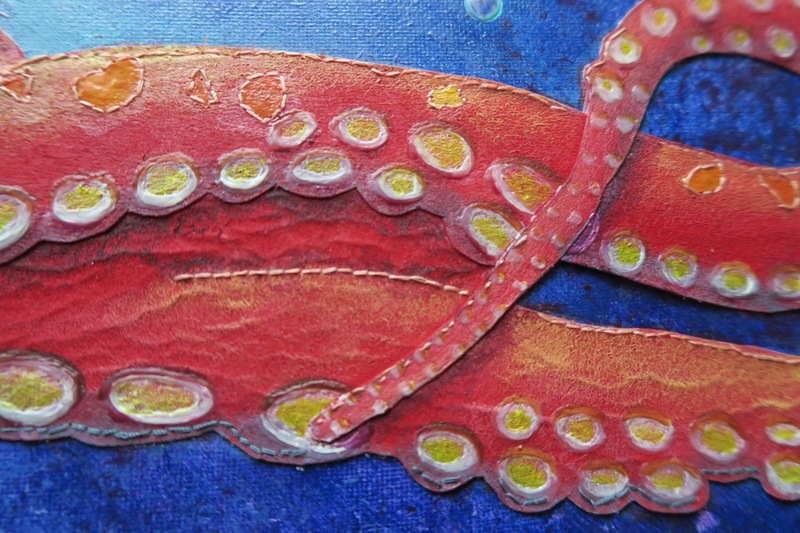 I painted the octopus red with blue reflections from the water. Elmer's glue was used for the suction things. I built up the circles twice. Then painted them with acrylics. I was worried that the fabric would come up over time, so it was sewing time. I sewed all around the octopus' arms, and on the head. 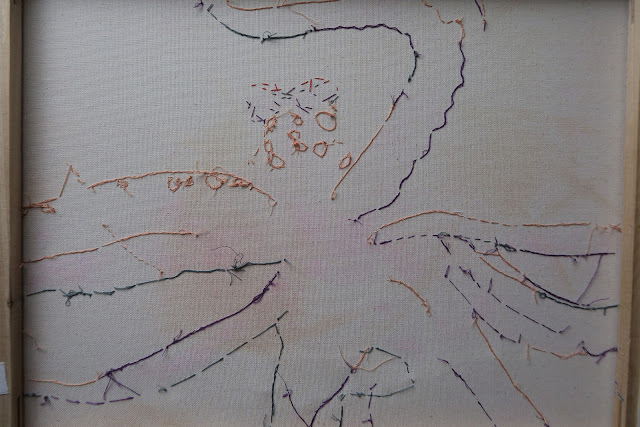 I don't mind sewing, but disliked getting close to the edge of the canvas where the wood is, and got annoyed making tiny knots all over the place. Ha! My husband said, "The background needs more." I bought foiled chocolates that are blue and green, but didn't like the looks of that. 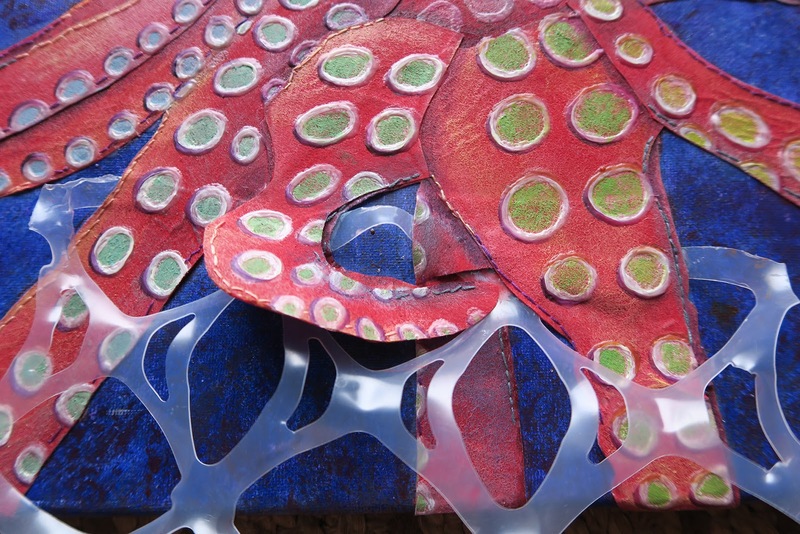 I cut out circles out of clear plastic, but they wouldn't adhere to the surface with Elmer's glue. I put drops of glue and clear acrylic paint on glass, waited for it to dry and pulled it up with a razor blade. That way I could move them around, and decide which ones I wanted where. I glued them down, and added acrylic lines around them. I already did 2 Native American pieces with city life taking over their land, an igloo with polar ice caps melting, a big sunflower with bees that have gas masks on. I really love this. I think your other ideas sound fascinating as well. I can't wait to see the finished works! This is brilliant love the Octopus's eyes heheh! My goodness, I LOVE the mix of mediums. That is absolutely brilliant! What a stunning and eye catching piece. What a marvelous piece of art. I never could have imagined how detailed the construction is. Wow, that is so cool. I could create something like that even in my dreams. This is an amazing piece of work Alissa, great message too! It is so sad that animal, birds, sea life and creatures get into trouble by things humans leave around. I think it turned out great. I love it and love how you used so many thing to make it look the way you did. That's an awesome art piece. I like how it turned out and can't wait to see the others when they're done.